I use this introductory slide to give an overview of the content and delivery method to be used on day two. We begin by looking at some sources of competitive advantage for Northern Ireland that have been identified in a recent article in the Belfast Telegraph. 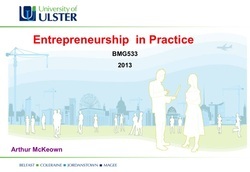 Then we revisit the ideas underpinning business model generation, using material provided in the handout. I then go on to give some examples of innovation and creativity at work in business processes and further examples, with some supporting commentary, of organisations that have been able to demonstrate success in developing robust business models. The day concludes with the identification of some further resources that may be of interest and an overview of the requirements for the assignment. The work of Clayton Christiansen provides a context within which I will be going on to provide, through the next few slides, some further examples of where innovation and creative business ideas or new processes can emerge from unexpected places. Getting to grips with the key principles in his ideas will provide some academic underpinning for the approach given here. 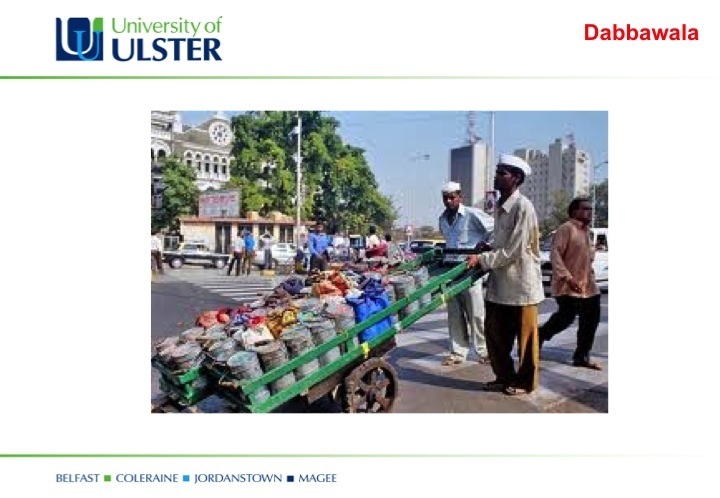 Toyota, one of the world leaders in quality systems, is looking closely at Dabbawala who deliver millions of dinners in India, with only one to two mistakes. They can produce quality on time and meet their customers’ requirements. Toyota want to see if they can replicate any of this into their organisation. Groupon and similar sites offers products or services at a reduced price: manufacturing companies have over-production, hotel offers, meal deals in restaurants. 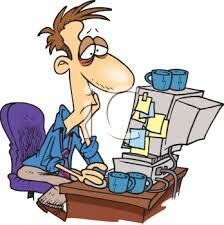 Some emerging business2business, rather than consumer2consumer, offers are coming forward now. Do not race into putting your offer on Groupon, however; look carefully, make sure it is fit for purpose. 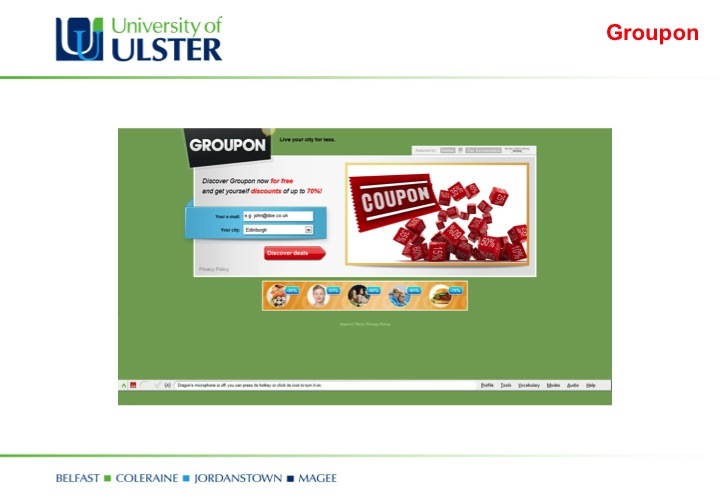 A writer of teacher training material in Dublin TEFL (Teaching English as a Foreign Language) charged 600 euros for his manual and he sold a few, but Groupon has been offering it for £49 – 120 hours of training material. He has sold thousands. 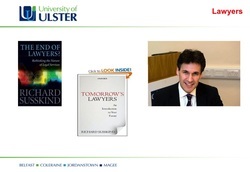 Richard Susskind, a law graduate from Glasgow University whose PhD at Oxford in the 1980s was on the role and potential of word-processing in law firms, wrote The End of Lawyers? in which he questioned whether lawyers would be able to continue to charge very large fees for their perceived expertise when a lot of the information and advice could be obtained online. 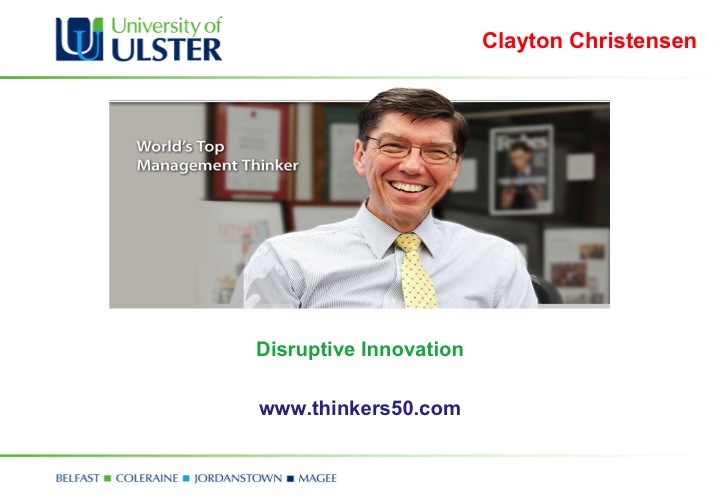 Reflecting Christiensen's ideas on how technology will change the way a lot of organisations operate, lawyers will need to commodise what they do. Tomorrow’s Lawyers is Susskind's most recent book. 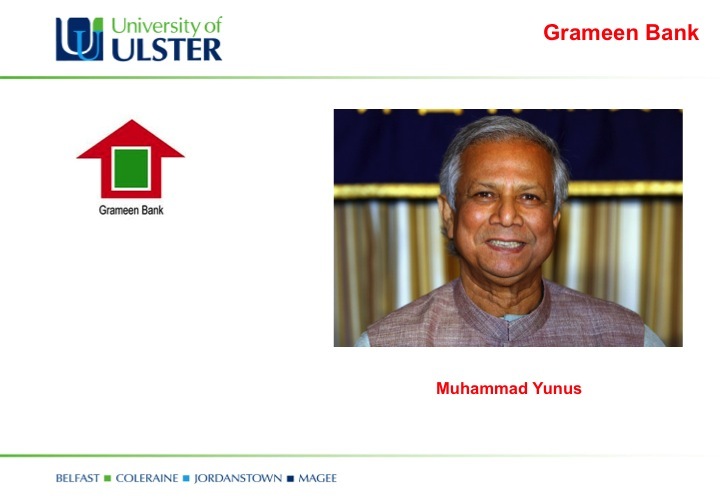 Grameen Bank was founded by Muhammed Yunus, a Professor of Economics in Bangladesh. Women in rural communities had business ideas for tiny enterprises that would be of value locally but they could not put their ideas into action because they needed a loan to get the necessary equipment. 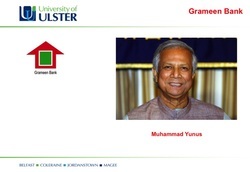 Developing the idea of micro finance, Yunus lent a few dollars to get their business ideas going. He won the Nobel Peace prize for economics in 2008; the acceptance speech is inspiring, looking at how the business models of more traditional banks and how they would normally lend money only if lenders had collateral. Peter Drucker (1909-2005)is regarded by many of his peers as the most significant management guru of modern management practice. 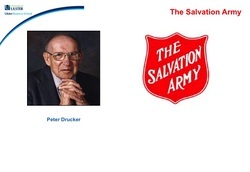 Born in Austria, he moved to America in 1937 and worked as a management consultant. His academic career began after the Second World War. The focus of his work is on the practical application of management theories to the real-world working environments in which managers work and have to achieve results. Working with big corporations in the USA, he had a knack of identifying trends in management and is responsible for a lot of the business practices in place today. He most admired the Salvation Army because they were much better than most organisations at identifying an idea, costing it out and investigating how they could put it into practice; and if they felt it was not feasible or viable, they dropped it quickly. As In the earlier section, there may be ideas for business development or business improvement you can take or adapt from the various examples provided here.